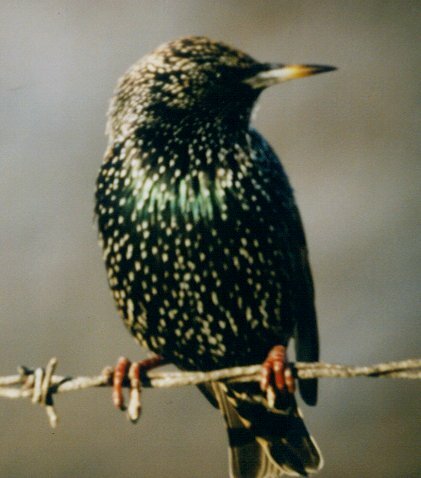 so i think the bird that smiled at me the other day was a european starling? it took me a while to figure that out. do not use force quit/cancel-force quit to manipulate your computer- i am pretty sure i broke mine today. i saw diary of chambermaid tonight and want to list the bunuel movies i have seen so i don't sound like an idiot for liking diary of a chambermaid so much. belle du jour: don't like it much. this movie is a joke perpetrated upon the bourgeosie. the milky way: about catholic heresies, deliciously confusing. diary of a chambermaid: totally awesome. and i HAVE seen the discrete charm of the bourgeosie but it was a really long time ago. et cetera. olsson's books/records/dvds has started renting movies, which is so awesome. besides renting chambermaid, diary of a, i bought personal days and the tracy chevalier book about william blake. i love TC - the girl with the pearl earring and the lady and the unicorn rock my world, embarrassingly enough. also, she attended the same high school and college as me. this isn't actually about stockholm syndrome. i had a dream that took place in new jersey the other night though. it was a bad neighborhood, there was a shootout, i hit the deck, the bullets just missed me. this totally reminds me of everything about myself and my "friendships" and relationships. thank you SO MUCH [gratuitous] cory arcangel ['s web log/mention for david horvitz who doesn't read this blog]. Lunch Meeting from Amir on Vimeo. (what's so funny about) a blog about peace, love and understanding?